Toronto: Harper Collins Canada, 1993 (hard cover). 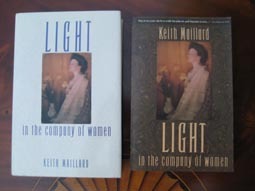 Writing Light in the Company of Women was the most fun I’ve ever had writing anything. I’d just come out of nearly two years of writer’s block to finish my fifth novel, Motet, and with it the entire body of work I’d outlined for myself at the end of the 60s. I was looking for a new beginning, something different from anything I’d done before. When I’d been incapable of creating words, I’d been working as a photographer. I loved the silence of images, and photography was very much on my mind. It was also a tradition in my family. One of our legendary old folks had been a pioneering photographer in the Ohio Valley— my grandmother’s uncle, Will Brown. I remember him, just barely, as the oldest human being I’d ever seen in my life. He died when I was eight, but his business—the W.C. Brown Company—kept right on going, run by another of my uncles. “The shop,” as we called it, was a magical place for me. As a child, I wandered around in the dark storage room in the back, marveling at the ancient cameras and odd items of photographic equipment that should have been in a museum. 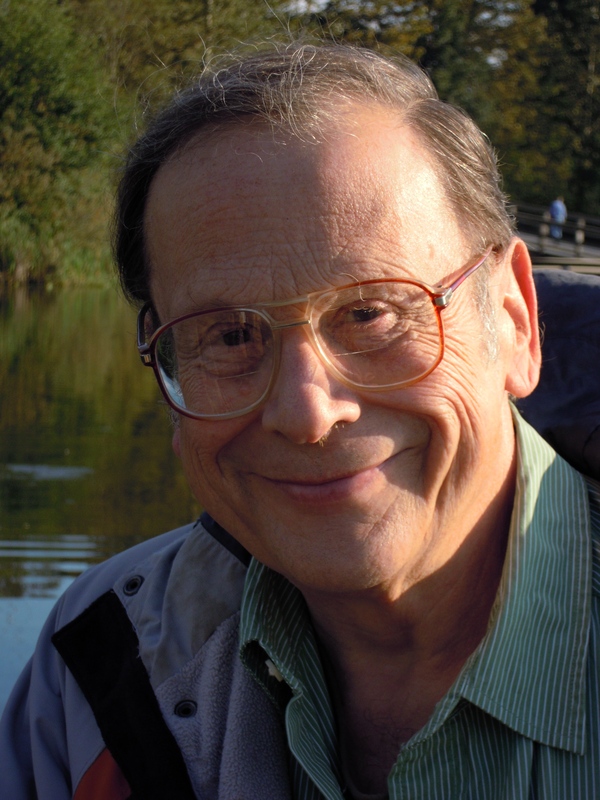 Sarsfield Middleton, the protagonist of Light in the Company of Women, is not based on Uncle Will. I didn’t know enough about Will Brown’s life to base any character on him. But Sarsfield’s photograph of Raysburg’s busy streets—a picture taken from the rooftop above his studio—was suggested by a similar picture of Uncle Will’s. If you want to see more of Uncle Will’s photographs, here they are. I decided to make my fictional photographer, Sarsfield, not only a pioneer photographer in the Ohio Valley, but a pioneer in color photography. Americans at the turn of the century seemed to have been fascinated by New York high society, so I gave Sarsfield a New York high society cousin. I immersed myself in the period and then turned my characters loose to bring the time alive for me—and, I hoped, for my readers. I wanted Light in the Company of Women not merely to be set in 1908; I wanted it to be written in the style of 1908, so I read, or skimmed, masses of popular fiction published between 1900 and 1910. I was looking for the elusive flavor of the period, for the preoccupations of the time, for the rhythms of the prose and the fictional techniques that were commonly employed. I even used an archaic punctuation system and checked my spelling in a dictionary from 1898. I had planned to write another novel about Sarsfield Middleton, taking him from the flu pandemic of 1918 to the crash of ‘29. I never got around to writing that book, but Sarsfield as an old man makes a cameo appearance in Lyndon Johnson and the Majorettes (pp. 94-96). 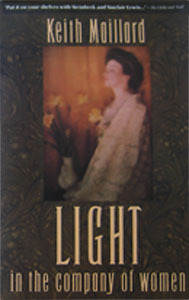 Light in the Company of Women was short-listed for the Ethel Wilson Fiction Prize. It is out of print. Neither Arch nor Sarsfield had ever been out of Raysburg before, and they found their new freedom wildly intoxicating; they walked for hours on the streets of Cambridge, then rode the street-car into Boston and walked for hours there. They looked at historical buildings; they looked at the graves in Mt. Auburn Cemetery; they walked along the Charles and looked at the gentle water and the trees; they looked at the shops and the centers of commerce; but mainly they looked at the girls. Sarsfield was already looking at her: a singularly handsome girl, tall and athletic, with tresses so pale that she had to be of the peroxide persuasion, with what was obviously paint on her cheeks and lips, she ran, laughing, from table to table delivering the pitchers of beer; Sarsfield had never seen skirts that short on a full-grown woman (they must have swung along nearly six inches above the sawdust! ); and beneath them twinkled an exquisitely well turned set of ankles and a pair of tiny, fast-moving feet clad in wonderfully bright red boots. As red, literally, as late cherries, those boots lodged themselves in Sarsfield’s memory and would not go away. What a subject for a color photograph! He wanted to capture her in her natural habitat; the owner of the establishment said he did not mind so long as his commerce was not interfered with. Just before he had left Raysburg, Sarsfield had completed his one-shot color camera; an intricate arrangement of German mirrors and prisms divided the light passing through the lens onto three photographic plates; the entire device was only slightly less large than a steamer trunk. He set it up on a tripod in front of the bar and suggested, hesitantly, that Mae might consider posing there. He had chosen the middle of the afternoon of a brilliantly sunny fall day; the broad saloon windows faced west, and the entire establishment glowed brilliantly. But his color filters cut the light to his plates by a good half, and Sarsfield needed all the illumination he could get; he decided to make a long exposure and augment it with magnesium powder. The question was how best to arrange his flash-pans; but, as Sarsfield studied the situation, Mae, just to get into the spirit of things, jumped onto the bar and kicked up her legs, showing, momentarily, the flounced edge of some undergarment. The customers sprang to their feet and began yelling encouragement. Caught between the fear of missing an absolutely splendid picture and a desire to get the lighting right—and, it must be admitted, somewhat muddled by a pitcher of beer,—Sarsfield did not bother to measure the flash powder, but piled it on lavishly just as he had seen his father do. He dumped about six ounces on a pan behind the bar as a back light, a good eight ounces on each pan in front of the girl, and at least twelve ounces on the pan above the camera. Running now (the men were chanting “Mae, Mae, Mae!” and banging their glasses on the tables), Sarsfield connected a wire to each pan, connected them all to the dry cell battery and the switch that would,—if the properties of electricity did not fail him,—set the whole works off at once. Arch, watching, was laughing so hard he threatened to topple over. Sarsfield threw the cloth over his head and focused the lens until Mae appeared sharply on his ground glass. All around him he heard a wild roar of pandemonium; some of the men were suggesting, in crudely effective language, that they would like to see somewhat more than Mae had yet shown them. Grinning, she hiked up her skirts to display her lace-trimmed bloomers. A yell went up that would have shamed a Republican nominating convention; when it subsided, Sarsfield shouted out the usual photographer’s order that everyone understood at once: “Hold it!” Mae froze, grinning at the camera; the men in the saloon froze. Sarsfield squeezed the bulb to open the lens. He had not had time to get out his stop watch; and he began to count in his mind just as his father had taught him: “Naught. One-half-and-one, one half-and-two—” At twelve seconds, he began to sense that his time was running out: soon someone would move and ruin the exposure. He felt perspiration pouring down his sides. At twenty-four seconds, he knew that he couldn’t expect the formidable, breathless immobility in the saloon to persist even a second longer; he gave Arch the sign to set off the powder. Then Arch would laugh uneasily, and Sarsfield would see in his friend’s eyes, once again, a total incomprehension. As tedious as it had been to make, the final result was delightful. There was Mae, captured by photography—her merry grin, her exquisite calves, her white lace bloomers, her cherry-red boots. Sarsfield did not realize until he had framed it and hung it on the wall what a spicy image it was; his classmates came to stare and snicker. They all believed that it was an oil painting. He could not convince a single one of them that it was a photograph.